The Sequence widget outputs a series of smooth transitions from one value to another over specified times (e.g. 0->500, 500->100, 100->1000, 1000->0). This can create a natural fluid motion or animation for graphics, motors, sound volume or any other output . Sequences can optionally loop. The widget supports up to 4 different sequences, triggered by four corresponding inputs. When an input value rises above the threshold value, the corresponding sequence is started (and if a previous sequence is running, it will be stopped and replaced by the new one). Connect the trigger input to the first inlet. When the value from this input enters the trigger range, the widget will output the sequence. The widget supports up to four different sequences, each triggered by a different input. In the “more” section, you create a sequence by putting one tween per line, with start, end, time. You can add as many tweens as you want, one per line. Several options are available for the sequences. 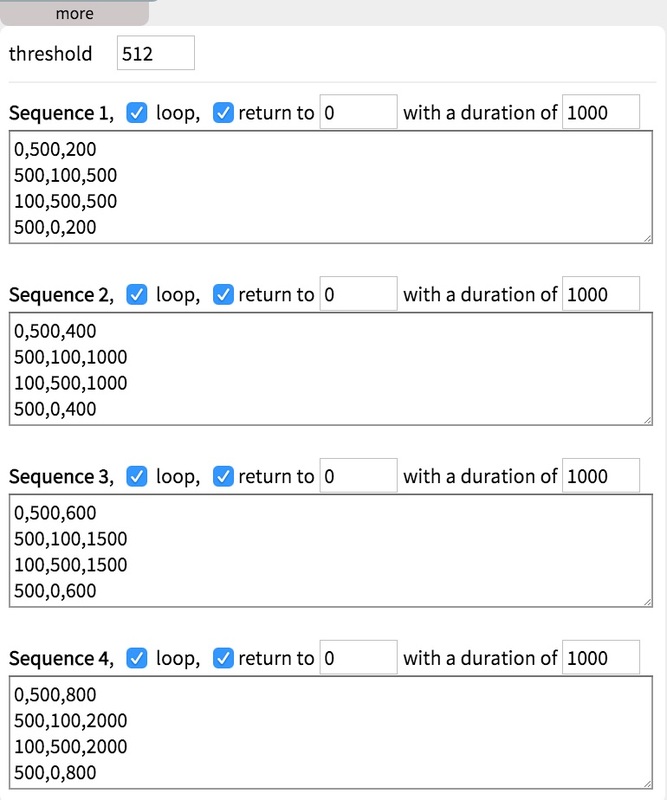 Loop – if checked, the sequence will output continuously. Return to – if checked, when the input falls below the threshold, the output will return to the value in the first field to the right, in the time set in the second field.